About the work: I created this app with the intention of it being educational, musical, and fun. I took the Solar System and scaled it down 31,536,000 times, turning the years of the orbital periods into seconds. Then I correlated the distance from the Sun to pitches on an 88-key keyboard. I chose these five asteroids because they each had very defining characteristics—each the largest of their kind. Essentially, the pitches are determined by the asteroids’ distances from the Sun, and the orbital periods become the rhythms that the pitches are played. It was a lot of fun to make, and I brought back some of my experience in Xcode, writing in Swift! Credit to fellow intern Jessika Raisor for the adorable asteroid artwork! 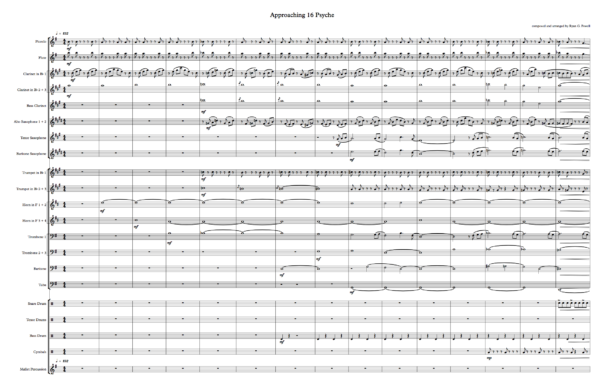 About the work: I wrote this marching band tune while thinking about the Psyche spacecraft coming up upon the asteroid. I tried to capture the excitement and beauty of the final moments before it enters orbit around the Psyche asteroid. I went pretty heavy on the brass and percussion during the main theme to really keep it driving forward. There are also a lot of little pointillistic elements, particularly with the woodwinds in the beginning, which I had imagined as stars sparkling in the background as the spacecraft travels. Parts were written for full marching band with the hope of it being recorded as well! I really enjoyed creating this piece—I hope you enjoy it, too! About the work: For this piece, I did some experimenting with 3D sound, or binaural sound. This is something that I’ve been interested in for a long time and was able to implement in this piece. I wanted to combine music and the 3D sound aspect to tell a sort of story on the way to the asteroid that uses sound bites from previous NASA missions, showing how far we’ve come leading up to the Psyche mission. In essence, it’s like a film score with 3D sound elements. I had a blast doing it, and I got some help from an actress friend of mine, Katrina Dykstra, who played the little fairy you’ll hear about halfway through. All that said, grab a pair of over-ear headphones, find a quiet room, sit back, close your eyes, and be taken on the journey! 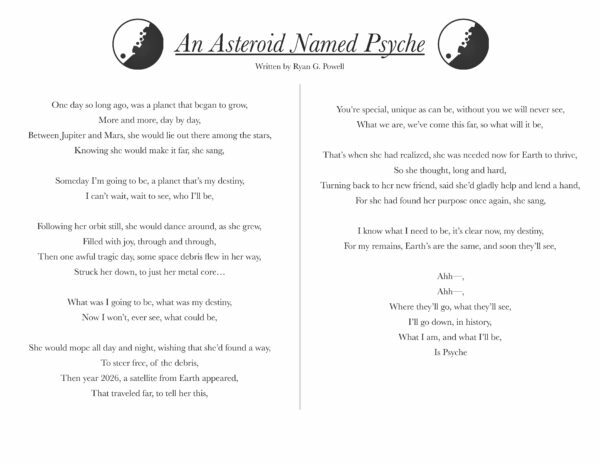 About the work: An Asteroid Named Psyche is a children’s song that I wrote, which follows the asteroid’s story. 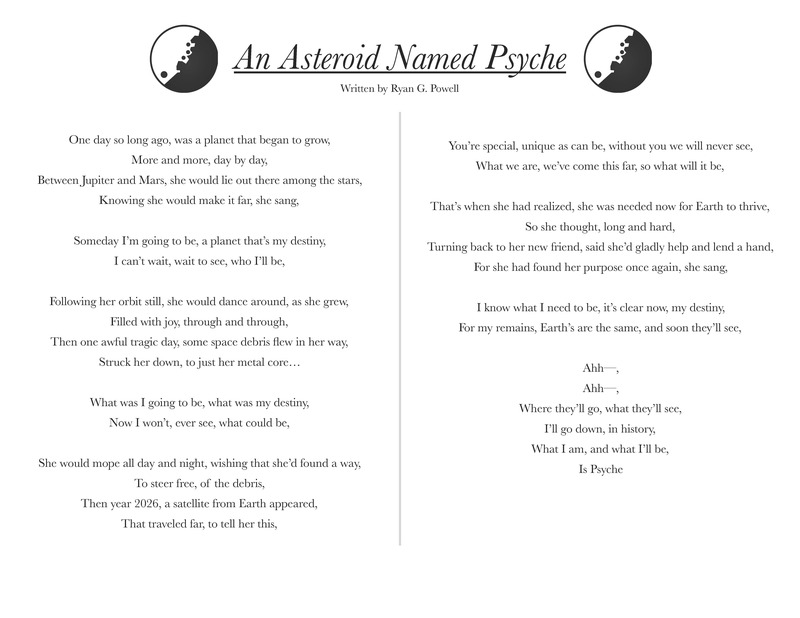 I wanted the song to be both educational and exciting for kids, so I brought the Psyche asteroid to life and created a story that could have a nice little moral while staying on target scientifically. I wanted it to be about ‘purpose’ because I think that’s something that a lot of kids really struggle with – myself included! 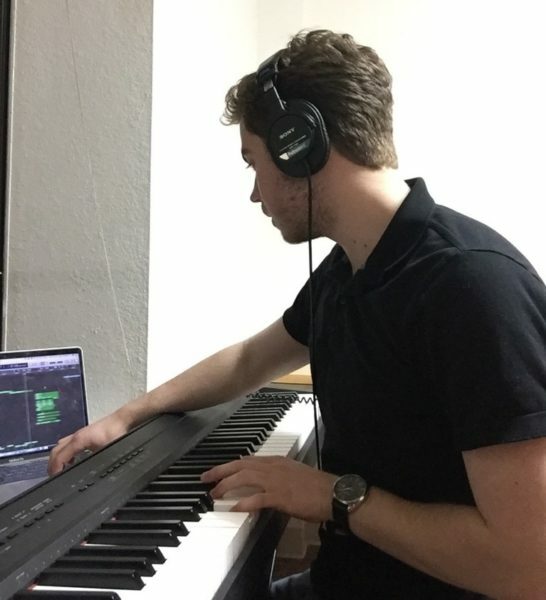 I aimed for the melody to be catchy, singable, and somewhat repetitive. 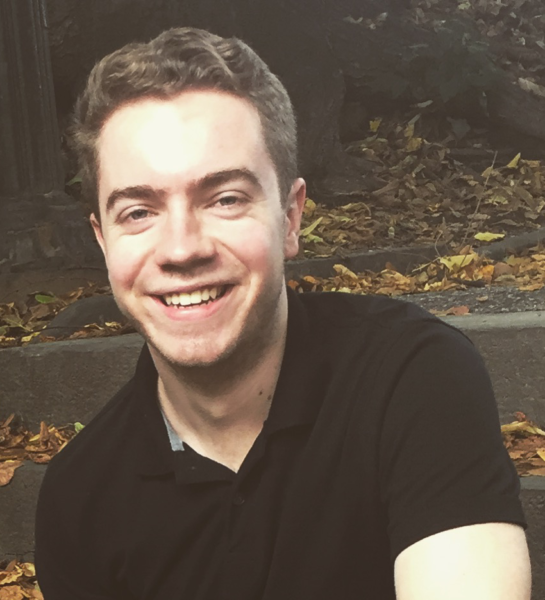 The vocals and guitar were recorded by my friend Amelia Murray, a New York City based singer-songwriter, who did an amazing job of giving the tune a character. Along with the recording, I created a lead sheet and a lyric sheet, both of which will be shared with various schools for any choirs or classes that would be interested in learning the song and learning about the mission!